Wessels type NLA-WG Smart Tanks are ASME removable bladder type pre-charged expansion tanks with WessGuard® bladder monitor. They are designed to absorb the expansion forces and control the pressure in heating/cooling systems. The system’s expanded water (fully compatible with water/glycol mixtures) is contained in a heavy-duty bladder preventing tank corrosion and waterlogging problems. If the bladder extends beyond the normal movement, WessGuard® monitor will activate an audible and LED alarm to notify maintenance staff of a potential system issue. In the case of compromised bladder integrity, water level will rise to activate the alarm. 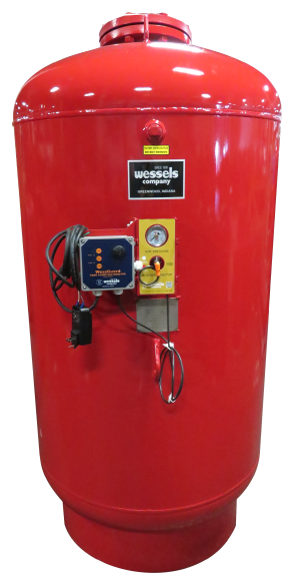 Wessels is America's leading supplier of custom & specialty tanks in Indianapolis, Carmel, Bloomington, Columbus, Evansville, Terre Haute, Lafayette, Ft. Wayne, South Bend, Indiana as well as Chicago, Quad Cities, Illinois, Des Moines, Iowa, Columbus, Cincinnati, Ohio, Detroit, Michigan, Louisville, Lexington, Kentucky, Minneapolis, St. Paul, Minnesota, Madison, Wisconsin, St. Louis, Missouri and other areas throughout the Midwest and the United States.